Borussia Dusseldorf faces another hard task after 2018/19 TTCLM semi-finals where they were eliminated by Russian club UMMC. The 30-time champion of Germany will play against Saarbrucken in the second leg of the 2018/19 Bundesliga semis, scheduled for tomorrow, Friday, April 5th. Saarbrucken beat reigning champion 3:2 in the first game held in Dusseldorf, thanks to Patrick FRANZISKA who beat both, Timo BOLL and Sharath Kamal ACHANTA. "For us it's like a final in April. Saarbrücken made a big step towards the finals. Patrick FRANZISKA is currently in top shape and hard to beat. They also have a top doubles”, explained manager Andreas PREUSS how strong is Saarbrucken. 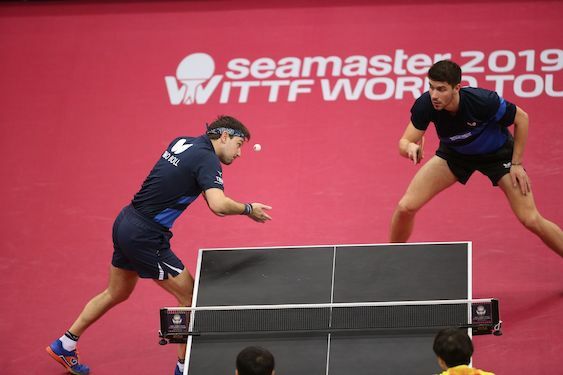 Timo BOLL (Borussia) and Patrick FRANZISKA (Saarbrucken) won Men’s Doubles silver at the recent 2019 ITTF World Tour Platinum, Qatar Open, but tomorrow they will play one against another. Manager of Borussia Dusseldorf Andreas PREUSS stressed that all players of his side are well prepared for the upcoming clash and the only question is who will play as no. 3, Anton KALLBERG or Omar ASSAR. Coach Danny HEISTER promised that his players are going to fight like lions to provide third semi-final clash on April 14th in Dusseldorf. Other two semi-finalists are TTF Liebher Ochsenhausen and TTC Schwalbe Bergneustadt. Hugo CALDERANO was man of the match in the first leg, contributing with two points in 3:1 win of Ochsenhausen.